Croatia is located in southeastern Europe. 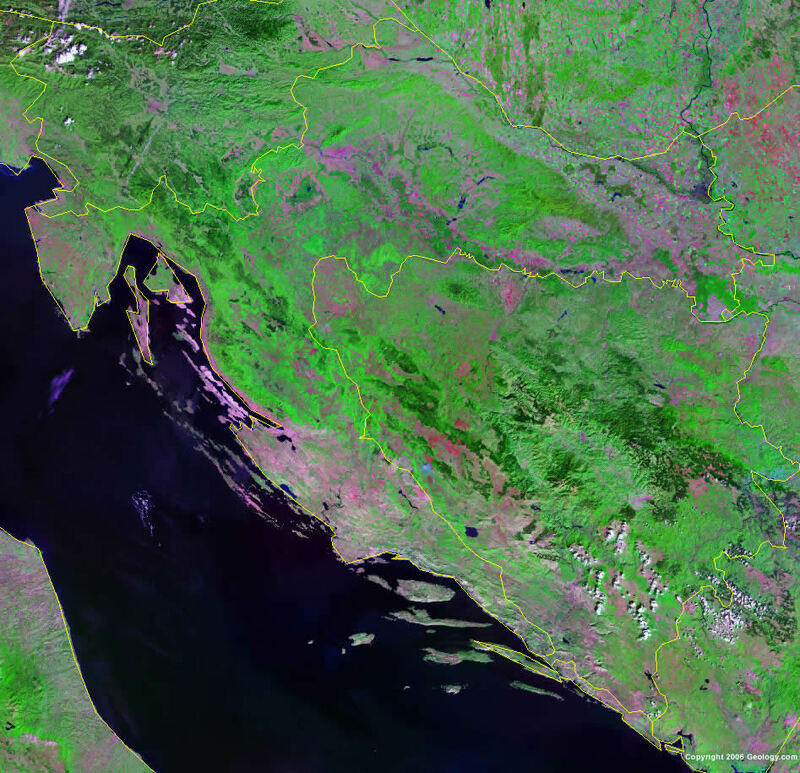 Croatia is bordered by th Adriatic Sea, Slovenia and Hungary to the north, and Bosnia and Herzegovina, Serbia, Montenegro to the east. Google Earth is a free program from Google that allows you to explore satellite images showing the cities and landscapes of Croatia and all of Europe in fantastic detail. It works on your desktop computer, tablet, or mobile phone. The images in many areas are detailed enough that you can see houses, vehicles and even people on a city street. Google Earth is free and easy-to-use. Croatia is one of nearly 200 countries illustrated on our Blue Ocean Laminated Map of the World. This map shows a combination of political and physical features. It includes country boundaries, major cities, major mountains in shaded relief, ocean depth in blue color gradient, along with many other features. This is a great map for students, schools, offices and anywhere that a nice map of the world is needed for education, display or decor. If you are interested in Croatia and the geography of Europe our large laminated map of Europe might be just what you need. It is a large political map of Europe that also shows many of the continent's physical features in color or shaded relief. Major lakes, rivers,cities, roads, country boundaries, coastlines and surrounding islands are all shown on the map. Bjelovar, Borovo, Cakovec, Dakovo, Dubrovnik (Ragusa), Gospic, Gradiska, Gruda, Jelsa, Karlovac, Knin, Kutina, Milna, Nova, Ogulin, Osijek, Osor, Pazin, Plitvica, Pozega, Pula, Punat, Rasa, Rijeka, Rovinj, Sibenik, Sinj, Sisak, Slavonska Pozega, Smokvica, Split (Spalatum), Varazdin, Vinkovci, Virovitica, Vojnic, Vukovar, Zadar, Zagreb and Zagvoza. Adriatic Sea, Boka Kotorska, Bracki Kanal, Busko Blato, Cetina River, Drava River, Duna (Danube) River, Hvarski Kanal, Korculanski Kanal, Lastovski Kanal, Lika River, Mljetski Kanal, Mura River, Neretvanski Kanal, Sava River, Viski Kanal, Vransko Jezero and Zrmanja River. Various mineral resources in Croatia include calcium, gypsum, natural asphalt, mica, salt, low-grade iron ore, bauxite, silica and clays. The fuel resources for this country are oil, hydropower and some coal. Destructive earthquakes are one of the natural hazards for the country of Croatia. There is air pollution from metallurgical plants in the country of Croatia. This pollution results in acid rain, which is damaging the forests. Additionally Croatia has coastal pollution from industrial and domestic waste. The country is undergoing landmine removal and reconstruction of its infrastructure following the country's 1992-95 civil strife.